True heritages of the Great War can be found on fleamarkets in Belgium and France. Helmets, guns, shells, soldierbooks, pictures, letters, books, gas-masks, pieces of equipment, personal belongings - nothing seems strange enough to sell. Some bargains come direct from attics and cellars of the inhabitants of the region, who kept it there over the years. Other things are still found in the fields and are sold right away, rusty or not. But most stuff is offered by collectors - and they usually ask high prices. One of the largest WW1 fleamarkets is held in the Belgian village of Kemmel (south of Ypres), usually on the first Sunday in September. Furthermore visitors of the Flanders-area can find a barter-and-fleamarket in café 'De Canada'. It is held every third Sunday of the month. This pub is located on the Meenseweg 470 (Menin Road), in Zillebeke, about 2,5 kilometres from Ypres. Something similar can be found, not far away, in cafe Spearhead in Dadizele (Beselarestraat 18), just beyond Geluvelt on the Meenseweg, on every first Sunday of the month. In Dadizele there is also a larger militaria-fair (in hall 'Den Ommeganck') every first Sunday of October. In the city of Ypres there are two militaria-fairs every year in February and March (the exact date differs every year) in a large hall next to hotel Rabbit, Industrielaan. Warning: Not all visitors of these sales are innocent WW1-fanatics. 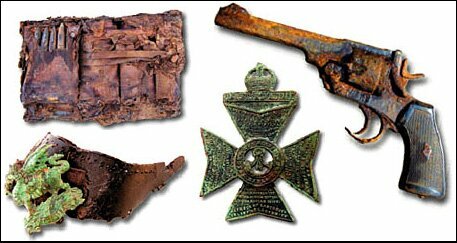 Some of them collect or wear dubious material, like Nazi insignia and badges and other militaria. You might feel a bit uncomfortable among them. If you prefer an ordinary shop, visit 'The Shell Hole' in the centre of Ypres, D'Hontstraat 54, or the Sanctuary Wood Museum at Hill 62. They sell original war-stuff, books and maps, at reasonable prices. In the Somme-area there are also many flea markets, usually on Saturday's and Sunday's in spring. Most of them are not planned far in advance, so I don't have specific information on data or places. When you visit the Somme in springtime, just watch the local signs. I know there are also WW1 fleamarkets elsewhere in France (Verdun, Argonne and Chemin des Dames ! ), but I have no detailed information about them - yet. Anyone who knows more agenda's, data or places where WW1 fleamarkets in France and Belgium (and Germany?) are held, please contact me.